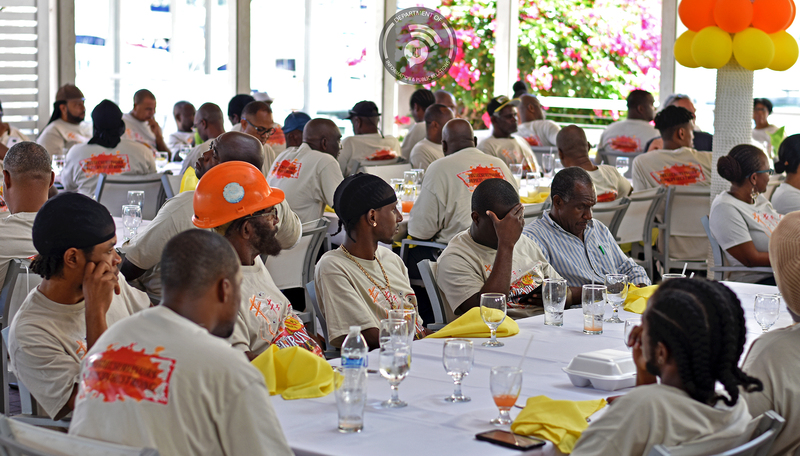 Workers at the British Virgin Islands Electricity Corporation (BVIEC) were treated to an appreciation luncheon and ceremony for a job well done during the restoration of power after Hurricane Irma in September last year. Minister for Communications and Works, Honourable Mark Vanterpool commended the workers for the excellent work done to restore electricity to the Territory. Over 90 percent of the BVIEC’s distribution and transmission network was destroyed after the devastating hurricane. Restoration to 99% of the grid was however done in six months. Chairman for the corporation’s board Mr. Ron Potter stated that restoration efforts were expedited because of the recently completed Phase V, which included the installation of three new Wartsila generators with a total capacity of 25.5 MW and the construction of the new building which withstood the hurricanes. Guest speaker, Dr. Michael Turnbull of the Wellness Center said he recognised that the workers were traumatised by the weather events as everyone else. He encouraged them to seek ways to cope from these experiences. Author of the Irma Diaries, Ms. Angela Burnett was also a guest speaker at the event. She expressed her gratitude to the workers and spoke about climate change and its link to last year’s unprecedented events. Meanwhile, the corporation’s General Manager Mr. Leroy Abraham praised the efforts of his workers and spoke of the unity that was seen following the impact of the hurricanes. Mr. Abraham also commended the teams from the countries who assisted with restoration work including Aruba, Belize, Bermuda, the Cayman Islands, Grenada, St. Lucia, St. Vincent and the Grenadines, Jamaica, the United Kingdom and Canada. He also paid tribute to independent electricians and retirees.